New Class: Kids Yoga Club!! Kids Yoga Club in Beggarwood Basingstokestarting Wednesday 16th November. Booking essential. I bet you have heard a lot about the benefits of Yoga! Yoga is great for adults and kids alike, it helps with flexibility, concentration and stress relief. I am a Yoga Alliance certified instructor and I regularly teach adult classes. 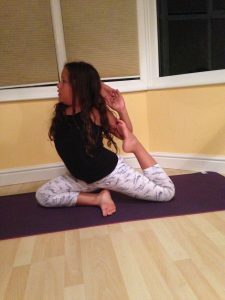 I have 2 kids myself and I have seen first hand how yoga can help children be the best they can be. I have wanted to start a Yoga club for a while and since I have a small studio at home in Beggarwood) and I am now DBS checked I would love to open this wonderful world up for as many kids as possible. Courses are 5 weeks long and a payment of £25 is due at the first session. You can book here: https://cherry-yoga.yogaclassnearyou.co.uk/offers.php?offer=10908 or contact me at marzia@cherryyoga.co.uk or 07879 339305 for more information.